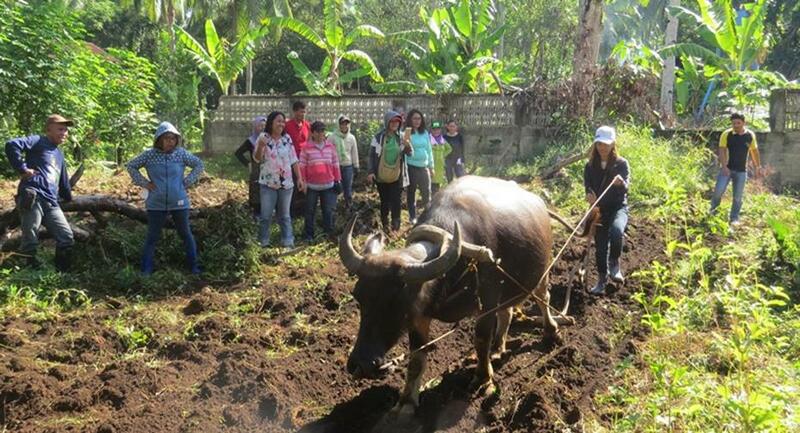 Actual plowing using a carabao as demonstrated by a training participant. Bacolod, Lanao del Norte---The role of the Agricultural Extension Workers (AEWs) in the region has never been crucial since envisioning food security in the country through excellent extension services in agriculture and fisheries. AEWs are extension agents of the Institute, the need to equip them with knowledge and skills are vital for them to reach out to the grass root level and farmer beneficiaries. Recently, a total of twenty three (23) participants composed of AEWs and farmers from the Provinces of Misamis Oriental, Lanao del Norte and Misamis Occidental attended the Competency Training on Organic Agriculture (NC II on OAP) at Queensland Herbs & Tourism Farm, Bacolod, Lanao del Norte and TESDA-LNNAIS, Bualan, Tubod, Lanao del Norte. The mounting of the training intended to enhance the participant’s knowledge and skills on organic agriculture production, the participants have undergone modules of the core competencies and electives used in TESDA NC II on Organic Agriculture Production (NC II on OAP) assessment. The participants were able to do actual plowing using carabao, practice producing organic concoctions and extracts, 'lokong making' & soil medium mixing, identification of different forage and pasture grasses, compute carbon nitrogen ratio for organic fertilizer production, compute population density of selected vegetables and compute feed formulation using pearson sqaure method.